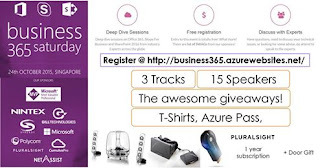 I will be speaking at the Business 365 Saturday Singapore on 24th October 2015 and already done with the slides and other preparations. If you are hanging around Singapore 24th Saturday, this is a must visit that you may not want to miss. Many good sessions arranged to 3 separate tracks make it a day for Business users, developers as well as IT administrators. All in all I am again glad to be a part of a good speaker line up. If you aren't done registering for the event yet, Hurry up! only a few days left. Register here.. Here are the two sessions I will be conducting along with a brief summary on each. Visual Studio workflows provides you better customizing options with a great design interface. There are some best practices that need to be followed in case of failures and different other interruptions. The powerful capabilities of Workflow Manager provides you many activities that can help you manage the business processes. Lets get to know some basics on workflows as well as some useful tips and tricks with 60 minutes. Azure Virtual Machines provide great capabilities that make developers feel better than running on local Hyper-V instances. Lets learn through some of our experiences on how we migrated from local virtual machines to cloud virtual machines hosted on Azure and the many benefits we have. Also some cost saving tips that are helpful when provisioning the Azure virtual machines.